Pearson’s Candy is one of those classic candy companies that has been around since the beginning. 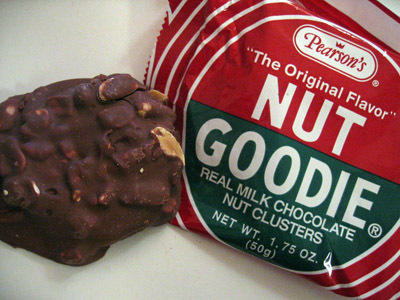 The company was started in the early 1900′s by the Pearson brothers, five in all, and in 1912 the Nut Goodie made its debut with a selling price of 5 cents. 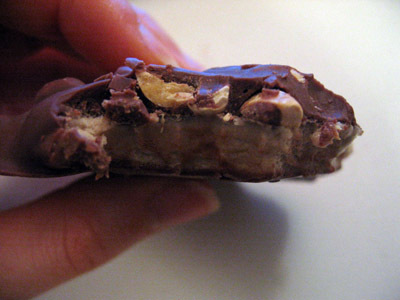 Along with the Nut Goodie in the trio of Pearson’s classics, there are also the Salted Nut Roll (similar to a PayDay) and Pearson’s Mint Patties. In 1998 the company also acquired the Bun Bar from the Clark Bar America company, with the Maple Bun bearing a close resemblance to the Nut Goodie. The Nut Goodie still sports its original retro packaging design, playing on red and green’s complimentary color status. The wrapper looks HUGE, but that’s because the Nut Goodie is a wide, not tall candy “plop.” The description reads “Real Milk Chocolate Nut Clusters” and glancing at the ingredients list, it does indeed use the real deal. It’s good to know that some companies still adhere to a quality standard. Upon unwrapping the Nut Goodie, it looks like a plop, but a very attractive one. The maple creme center is evenly formed and enrobed, while the peanuts actually look like they’ve been attached to the interior ingredients as opposed to dropped on top. The shape is more wide than tall, with the actual height being about 1/2 an inch. The taste is very sweet and nutty with a strong maple flavor to it. Even more “mapley” than its stepsister candy, the Maple Bun Bar. The milk chocolate is wonderfully smooth and full tasting. The peanuts are fresh, a little salty and have some give to them, so no pieces are getting lodged in my teeth (yay!). The texture is fantastic because you get crunch from the peanuts, a cool smoothness from the chocolate, and then a fluffy richness from the maple fondant interior. Very addicting and very, very tasty! So if you see a Nut Goodie, give it a try! It’s hard to say no to a candy bar that has a good 90 years (and counting) to its name.